The task of recovering the dead and wounded from the forward trenches and No-Man's Land had begun on 1st July, but could only be carried out at night, and mostly stopped at dawn on the 2nd, although some brave stretcher bearers continued to work, and several received awards for their gallantry. The work of recovery continued for several days, sometimes with the Germans allowing unofficial truces, sometimes under continued enemy fire. Some men lay wounded for many days, and of course many died before being found. The longest recorded survivor was found fourteen days after the opening battle, a private of the 1/4th London Regiment, wounded at Gommecourt. A letter written after the War to the Official Historian mentions some of the difficulties encountered, confirming that the removal of wounded on July 1st was impossible until the night, and that the numbers of stretcher bearers was inadequate, the men being completely exhausted by 3 a.m. The letter goes on to say that at that time the dugouts in both British and German front lines were full of wounded, and that the whole of No-Man's Land on the 34th Division's front was covered with both dead and wounded. Additional men were provided by the Corps, and men were brought in on the nights of 2nd and 3rd July, so that by the morning of the 4th most of the men on the Divisional front who were still alive had been recovered. A few days later 2,200 men were buried. The writer's view is that the breakdown of the recovery system on July 1st was due entirely to the exceptional numbers of wounded, and the ordinary organisation was unable to cope. For several days Private James A Brown lay wounded on the battle field, and was in fact reported 'Missing', this being recorded in the Newcastle Daily Journal of 14th August 1916, a reflection of the time taken for news to filter back to England. The 71st Field Ambulance Diary gives an insight into the activity regarding casualties in the area behind the former Tyneside Scottish trench lines. 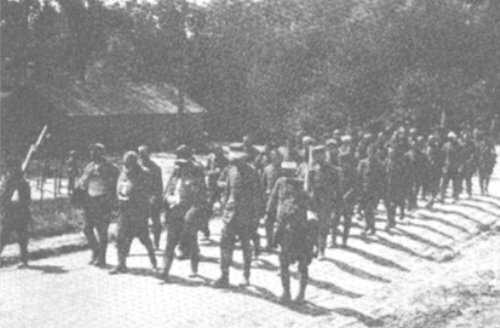 The unit had taken over from 102nd Field Ambulance on July 3rd, and reported little activity for the next two days. However, between July 6th and 8th some 640 wounded passed through the units Collecting Station at Dernancourt. The weather continued to deteriorate, and it rained heavily during the afternoon of 7th, and through the following night. Although July 8th saw fine weather, the ground was very heavy. On July 9th, 71st Field Ambulance was replaced by the 69th F.A., and the Diary outlines the arrangements made by the previous units, there being a Main Dressing Station in the church, whilst stretcher cases had their wounds dressed and were then held in tents alongside the church whilst awaiting evacuation to the Casualty Clearing Station. Walking cases were moved to the large hut mentioned previously, and from there by ambulances, buses and lorries to the Medical Rest Camp. In addition there was an Advance Dressing Station at Fricourt, and a Collecting Station at the end of a tramway on the Moulin Vivier - Albert road. On the day it took over, 69th Field Ambulance admitted 105 wounded, and also 6 Germans. At 6 a.m. on the 10th a further 152 were reported as being admitted since 9 p.m. on the previous night. Throughout the day a steady flow of men were admitted, by 12 a.m. the number recorded for the previous 24 hours was 290, and between then and 9 p.m. a further 54 were added. Ambulances and lorries continued to bring in wounded overnight and between 9 p.m. on the 10th and 6 a.m. on the 11th July the total was 315. At 8 a.m. the unit handed over to the 2nd Field Ambulance. An entry in the Diary recorded at 10 a.m. on the 10th July notes that a 'large quantity of equipment belonging to wounded handed over to Salvage Officer'. An entry in the Diary of the 69 Field Ambulance, dated Fricourt, 7th July 1916, and written at the request of Capt. Brereton, Official Medical Historian of the War, outlines the plans which had been made for evacuating wounded from the battlefield, and what actually happened in the event. "At the beginning of the four days fighting, the medical arrangements were that 70th F.A. was to evacuate wounded from left Brigade, i.e. on left of Sunken Road via Sausage Valley to A.D.S. at Becourt Chateau and 69 F.A. 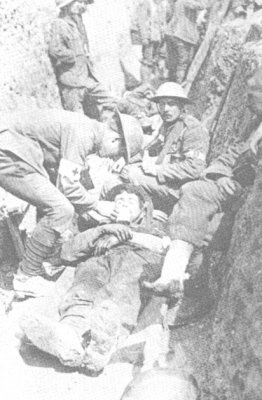 wounded of right Brigade on right of Sunken Road. Owing however to the Brigades being on a skew front, with Sunken Road running diagonally across it, and being the only road, the majority of cases were carried both from the right and left Brigades on to the Sunken Road, and so to 69 F.A. A.D.S. Particularly did this become the usual route after the heavy rain on 8th, which made the trenches of Sausage Valley almost impassable, whereas the road was always usable by wheeled stretchers. The direction of the advance also, towards N.E., i.e. right front accentuated this tendency. O.C. 70 F.A. therefore asked to be allowed to send cases through 69 F.A. A.D.S. and with consent of A.D.M.S. 23 Div placed 2 bearer sub-divisions under Capts. Russell and Llewellyn at my disposal. A.D.M.S. 23 Div also sent one section 71 F.A. under Capts. Picken and Bramwell, and sanitary section under Capt. Messent. There were therefore two tent sub-divisions with four officers, and six bearer sub-divisions with four officers, and Capt. Messens in charge of supplies, and it was possible to arrange regular reliefs for tent sub-divisions, and to some extent for bearer sub- divisions. The absence of office work owing to the 69 F.A. having no M.D.S. enabled me to supervise the whole proceedings with undivided attention." The Diary also contained a sketch map showing the positions mentioned in the account. Eventually, James Brown managed to regain the British lines, whether alone or with help is not known, but it is likely that he was treated by 69th Field Ambulance. Subsequently the 'Journal' recorded on 31st August 'J A Brown 1745 (North Shields) previously reported MISSING, now reported NOT MISSING'. Of the 17,758 men originally reported as missing, just over a quarter returned unharmed or were taken prisoner, 10,705 were found dead, and 2152 were never found. These Diary entries reflect the routine for evacuation of wounded men. Firstly, they would have been helped or carried to the Regimental Aid Post, consisting of just one doctor of the Royal Army Medical Corps, assisted by approximately thirty-two private soldiers of the Regiment, acting as stretcher-bearers - they were usually members of the Regimental Band. The Aid Post would be "housed" in a shell hole or trench a few yards behind the front line. The treatment would be limited to a field dressing and an injection with morphia. The patient would then be taken back to the Advanced Dressing Station. This would be about two to five miles behind the front line and transport would depend on the severity of the wound, the choice available being walking, sitting in a lorry, sitting in an ambulance car, or carried on a stretcher either on foot, by ambulance or on a special miniature railway. At the A.D.S. some attempt would be made to treat the wound but in most cases only the dressing was changed. Assuming the wound was bad enough to prevent return to duty after simple treatment, the patient would await his turn in the queue for a place in one of the string of motor ambulances of the Motor Ambulance Company, to take him to the next point of treatment, the Casualty Clearing Station. 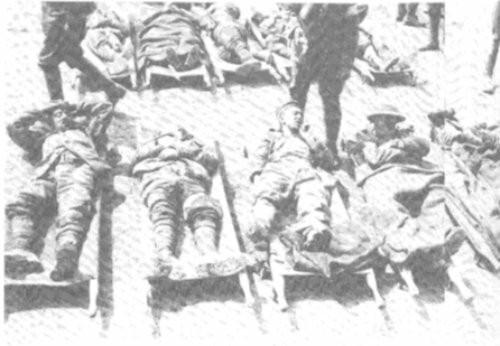 When the pressure of battle gave rise to a large number of casualties the ambulant patients would be conveyed by lorry, and a number of extra Collecting Stations were set up. 1. To return the patient to the front. 2. To transfer him to the Base Hospital, usually in England, for complete recovery. 3. If neither of these was possible due to the severity of the patient's injury, or condition, to give sufficient treatment to enable him to travel. Full operating facilities were available and a small staff of female nurses was assisted by members of the Royal Army Medical Corps. Teams of convalescent patients were also employed. All of this in a collection of tents only seven to thirty miles from the front line, sometimes within range of shell fire and often subject to bombing, in spite of the Red Cross flag flying overhead. If the patient were to be returned to England, this would be by one of two routes. Firstly, he could be taken by Ambulance Train to a Base Hospital in France, housed in a permanent building such as a requisitioned chateau, and from there by train to a Channel Port, or directly by Ambulance Train from the C.C.S. to the port. After the ferry crossing to England, the patient would then be taken by rail to a hospital, usually Military, until either sufficiently recovered to be returned to active duty, or pending his discharge from the Army. Most of the mass of records resulting from a soldier's transfer from one treatment centre to the next have unfortunately been destroyed, and so it has not been possible to trace exactly what happened to James Brown. What is known is that he was taken back to England, spending some months in hospital at Warminster, but was unfit to return to active service and so was discharged. The toll of casualties for the Tyneside Scottish was huge. It is difficult to be precise over figures, as different sources vary in their totals, but the most immediate numbers come from the War Diaries of the Battalions themselves. That of the 1st records 10 officers and 62 other ranks killed, with 10 and 305 respectively wounded. In addition 7 officers and 267 men were missing. The 2nd Battalion records losses of 12 officers and 55 men killed, with 10 and 286 respectively wounded. The number of missing is recorded as 116. The 3rd Battalion lost 18 officers killed, with 10 wounded and one missing presumed killed, and 194 men killed, 324 wounded and 155 missing. The 4th Battalion lost 9 officers killed with 7 wounded, and 178 men killed and no less than 444 wounded. Again, the number reported missing is not known. In his book 'The First Day of the Somme', Martin Middlebrook gives casualty figures which show that 34th Division suffered the heaviest loss of any Division, with 6,380 killed, wounded or missing. 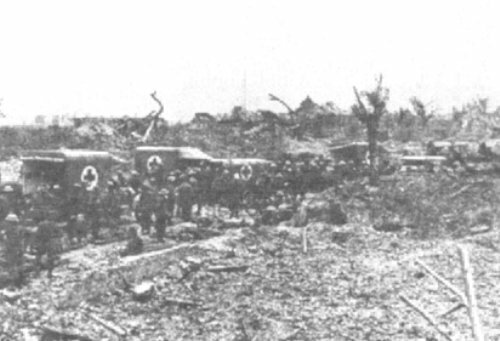 (The next heaviest losses were 29th Division with 5,240.) The Tyneside Scottish and Tyneside Irish suffered more casualties than any other Brigades in the Battle. Middlebrook gives the following figures: 4th Tyneside Scottish, 19 officers, 629 men; 1st Tyneside Irish, 18 and 602; 1st TS, 27 and 557; 4th TI, 20 and 519; 3rd TS, 20 and 517. (The other battalions are not specifically mentioned as they had less than 500 casualties.). Another indication of the losses can be found in 34th Division's General Staff War Diary, which records that, on 5th July, the Commander of III Corps, Lt Gen Sir W.P. Pulteney, visited the camps of 101st, 102nd and 103rd Brigades, then at Baizieux, near Bresle, and spoke to the men, congratulating them on the manner in which they had carried out their attacks. Of a normal Brigade strength of some 4,000 men, 101st and 103rd (Tyneside Irish) managed to parade some 1,100 men each, and 102nd (Tyneside Scottish) approximately 700 men. A telegraph of congratulation from General Sir Henry Rawlinson was received at the same time. The gains by the two Brigades amounted to some twenty acres of previously German-held ground. The loss of nearly three-quarters of the two units reflects not only the strength of the German defences, but also the courage and determination of the Tynesiders attacking them. Some prisoners were taken on both sides, and a writer after the War recalled that "The lack of prisoners in 3rd Corps was severely felt. I remember one of the Intelligence Officers buying 100 from a sergeant belonging to the next Corps - 15th Corps - who was conducting them to the 15th Corps cage. They were sent to the 3rd Corps cage for the price of 10 francs!" As the unit was so far below operational strength, some adjustments to organisation were necessary. The two Tyneside Brigades were transferred to the 37th Division, in exchange for two from that Division which were up to strength. The 37th Division was currently holding a portion of the line near Arras, and consequently the Tynesiders were bussed at first to Pommera, and then via Warlincourt to billets at Divion, west of Arras. As a temporary measure, the 1st and 4th battalions were formed into a single unit, as were the 2nd and 3rd. The Battalions were eventually brought back up to strength, but not with Tynesiders, men arriving from wherever they could be found. Despite continuing until the end of the War as the 'Tyneside Scottish' it was no longer a unit of men with a common bond, and the comradeship and 'esprit de corps' of the unit raised in Newcastle and trained at Alnwick never returned. This is reflected in a letter received after the War by the Official Historian, in which Col. R.V.Turner wrote: "The 68th Brigade, in which I was serving, consisted of 10th and 11th Northumberland Fusiliers, and 12th and 13th D.L.I. (the latter being the battalion of which I was in command). During this period I received a draft of about 200 Northumberland Fusiliers (Tyneside Scottish), and the 10th and 11th N.F. received a draft of the same number of D.L.I. Believing that a mistake had been made, the other C.O. and I concerned applied to be allowed to exchange drafts. Higher sanction was not however forthcoming. Most of my draft of N.F. were men returning to the line, after recovery from wounds, received when serving with their own Regiment; and a fine lot of men too, who served their alien battalion well. It was, however, a sad business to divest these men of their Regimental badges, and dress them up in kit of another Regiment (although that Regiment was my own)." The Brigade spent most of the next year in the area, taking part in the Battle of Arras between 9th April and 14th May 1917, which included the attack on Vimy Ridge undertaken by the Canadians, whose monument now stands there. Further changes in organisation saw the Tyneside Scottish reduced to a cadre in May 1918, and subsequently attached to 116th Division and 66th Division. Finally, on Armistice Day the Brigade was located near Aumale, about 20 miles west of Amiens.